Learning how to install a garage door opener doesn't take long to do; the job itself takes just a few hours with some help, but the way it impacts the quality of your life will last you for years. With an automatic garage door opener installed, your life will become just a little easier. Most garage doors operate using the same principle - a motor opens and closes the door by rotating either clockwise or counterclockwise. The door is hoisted or lowered by a chain that translates the rotational direction of the motor. A limit switch is usually placed along the upper edge of the track which automatically stops the door once it is fully opened and likewise, a pair or safety sensors are usually installed at the base of the track to prevent the door from closing down on someone or something. The T-rail is usually comprised of three sections. Align the three sections and connect them according to the directional stickers or markings. Install the bolts to secure it as one, long rail.Bolt the idler pulley to the end of the T-rail and slide the trolley onto the rail. Bolt the other end of the T-rail to the top of the motor housing unit. Insert a thin screwdriver through the T-rail to hold the trolley in place. Wrap the chain around the sprocket on the opener and guide it along the rail, around the pulley and connect it to the end of the trolley that's closest to the opener. 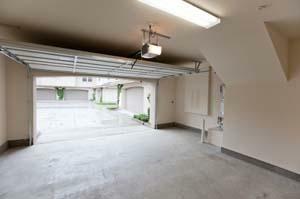 Open the garage door partway and measure its height from the floor. The bracket for the T-rail needs to be installed two inches above the highest travel point of the door. If a wall stud is not available for the bracket to be connected to, secure a length of spare 2" x 4" horizontally to the framing at the height you need and install the bracket to it. Attach the end of the T-rail with the idler pulley to the bracket that's mounted on the wall. Lift the other end of the rail (the motor housing) and rest the housing unit on the top of an opened stepladder. Open the garage door all the way and slide shims under the housing unit until the T-rail track is one and a half inches higher than the garage door. Attach the steel mounting bracket to the ceiling joist above the opener and secure the opener to the bracket using the two bracket bars. Secure the door opener control button to the wall approximately five feet from the ground in an area that's convenient for you. The indoor control unit is typically wired to the motor housing, so run the wire up the wall and across the ceiling so you can make the connections. Use insulated staples to secure the wire to the wall and ceiling approximately every 12 inches to prevent loose or drooping wires.Install the electric eye sensor near the base of the garage door, run the wire from it to the housing unit and make the connections. Use insulated staples to secure the wire to the wall and ceiling like you did with the controller's wires. Secure the door bracket to the top of the garage door with bolts so that it is directly below the T-rail bracket.Attach the straight door arm to the trolley and attach the curved door arm to the bracket on the garage door. Bring the two arms together and use bolts to connect them. Plug the garage door opener in and press the controller button to test your installation. Keep in mind that these directions for how to install a garage door opener are for a basic installation. Some new garage door openers may have special instructions that are exclusive to the model, so always read the manufacturer's printed instructions that come with the unit before you install it. In addition, an automatic garage door opener requires a source of power, typically an outlet, located somewhere nearby, or preferably in the ceiling. If you don't already have one installed, install one or hire a licensed electrician to do it for you.